This was today's message to teachers. Leaving things in mailboxes is always hit or miss. Several mailboxes still have a nice pile of all my messages, and I'm sure a few others went directly into the recycling bin. But today, I smiled when I went to a team meeting in a teacher's classroom, and there posted to her wall were all my messages--viewable for everyone to see. My day today was like pretty much any other Thursday. Read and answered emails in the morning, waited for paperwork for a student transferring into our district so I could put together his new schedule, went to 5th grade and 6th grade team meetings, met with a few 8th graders and went over "relationship rules." We also are putting together positive reminder jars. (I'll post some pictures of these in a future post) and then had 2 lunch bunch groups today. Lunch Bunch groups finished up a project from last week and those that were finished worked on the National School Counselor Week Crossword Puzzle Challenge. In case you missed it, you can download the crossword puzzle here. Today's ASCA photo challenge is Appreciation. The photo below was pretty special. Andrea Burston, a school counselor in North Carolina and blogger at jyj counselor blog sent me a post card with a sweet note and gift card to Starbucks. We have never met, but have corresponded several times, and I am really hoping to meet her in person this summer at ASCA15. This really was such an awesome surprise and super sweet. I wish I had thought of it myself! It will be an idea that I will "creatively borrow" in the not so distant future! Can't wait to see pictures tonight on Facebook and Twitter of the treats and surprises other counselors received later today when I leave school. Yay, I'm so glad that you received the card just in time! 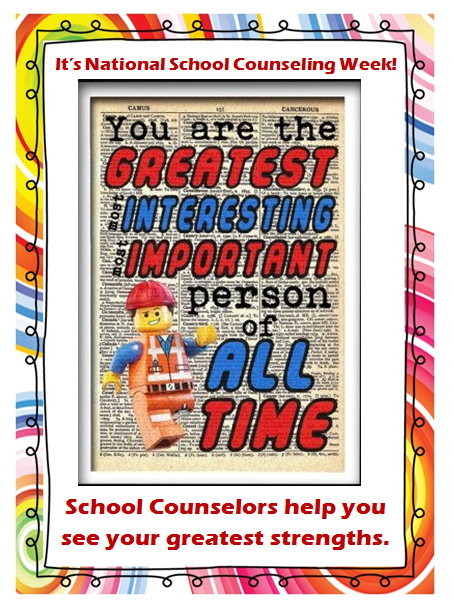 Looks like you had a fantastic NSCW15!